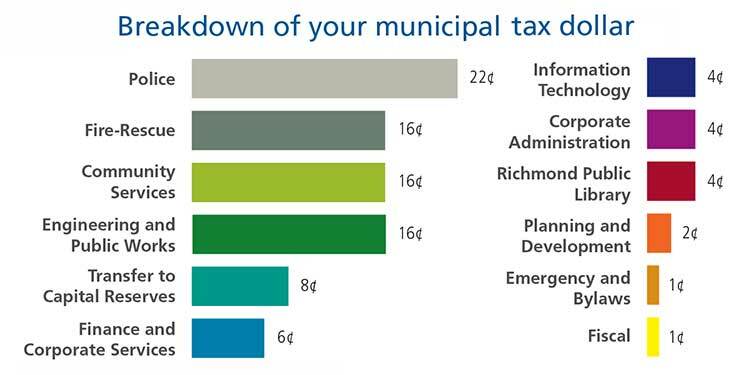 Here is how a 2019 municipal tax dollar is broken down. Richmond City Council recently approved our 2019 operating and capital budgets, which include substantial investments that will protect and enhance community safety, while continuing to ensure that other important basic services are maintained and enhanced. The key investment in this year’s budget is funding to support major increases in both police and fire staffing. In all, funding has been provided for 107 new positions to be implemented over the next three years. The 2019 budget allows us to further address the needs by providing ongoing operating funding for 51 additional RCMP officers and 20 municipal employees at the Richmond RCMP detachment over the next three years. At the same time, we are also addressing the need for increased fire and rescue capacities to serve developing areas of our community. Council approved funding for the hiring of an additional 36 firefighters over the next three years. These investments further support the significant capital investments Council has made in community safety infrastructure over the past decade and a half. Our ambitious building saw completion of five new fire halls, a major retrofit of a sixth fire hall and the purchase and renovation of the Richmond Community Safety Building, which is now home of the Richmond RCMP detachment. Later this year, we will open a new expanded City Centre Community Police Office at Gilbert and Granville. This new office will provide increased enforcement and faster response times within the City Centre. It will also enhance delivery of our many crime prevention programs. We are also committed to excellence in all of our public services. Richmond Public Library is a good example. Council recently expressed its support for the Library’s new 2019-2021 Strategic Plan, and has worked with the library board to ensure it continues to invest in expanding the library’s collection, including e-books. We also supported the library’s introduction of its Launchpad, an innovative digital learning space in the Brighouse library which offers creation stations with digital scanners, 3D printers and more. Free learning sessions on how to use the equipment in a relaxing, modern setting are offered. Last year, we provided additional funding to allow the library to expand its services for seniors. The library also introduced new book dispensing technology that allows for the expansion of services beyond our existing branches. A new book dispenser was installed in the Hamilton Community Centre last year and I was pleased to support funding in this year’s budget for an additional dispenser to be placed in the new Minoru Centre for Active Living. Our investments ensure that Richmond residents continue to receive an enviable quality of civic services. Through prudent financial management, we also ensure residents receive good value for these services. We continue to have some of the lowest property taxes in the Metro Vancouver region. To learn more about our 2019 budgets and our Five Year Financial Plan visit www.richmond.ca/5YFP.